Welcome to outer space, or at least the way it looked 60 years ago. Flying saucers, scary Martians and metallic electronic music are just some of the things expecting you when you enter the Sputnik. 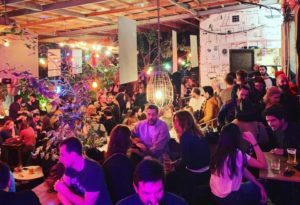 Getting back to our days, the Sputnik is one of the coolest bars in Tel Aviv. As you enter the small passageway, you are fronted with a beautifully decorated Garden and cool People. The Sputnik offers three different spaces which makes it an ideal spot for a complete nightlife experience. 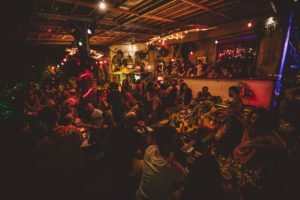 Besides the chill Outdoors area, where you can have a drink and a snack, inside, there are two bars and a dance floor for people that want to go crazy. The musical lineup in the satellite (that’s how they call the room with the dance floor) is really impressive with some of the biggest names in Tel Aviv music scene playing there on a regular basis . Sputnik is definitely a late-night place where things start to heat up around midnight and go on till the early morning. 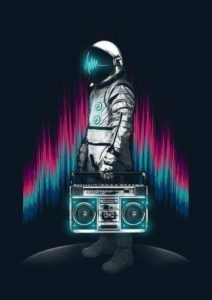 So, put your space helmet on and join the fun.